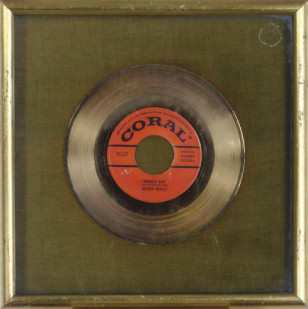 Pictured left: Buddy Holly – A Gold Record award, circa late 1950s, for Buddy Holly’s Peggy Sue. Presented in a glass enclosed, green velvet frame. 12 x 12 in. (30.4 x 30.4 cm.) sold for $11,875 against an estimate of $3,000 – $4,000 at Christies rock and pop memorabilia auction, 30 November 2007, New York, Rockefeller Plaza. He was always known as Buddy to his family. In 1949 Buddy made a recording of Hank Snow’s ‘My Two-Timin’ Woman’ on a wire recorder “borrowed” by a friend who worked in a music shop (not, as is often reported, a home tape recorder), his first known recording. During the fall of that year he met Bob Montgomery in Hutchinson Junior High School. They shared a common interest in music and soon teamed up as the duo “Buddy and Bob.” Initially influenced by bluegrass music, they sang harmony duets at local clubs and high school talent shows. In Lubbock, Holly attended Hutchinson Junior High School, which has a mural honoring him, and Lubbock High School, which has numerous features to honor the late musician. His musical interests grew throughout high school while singing in the Lubbock High School Choir. 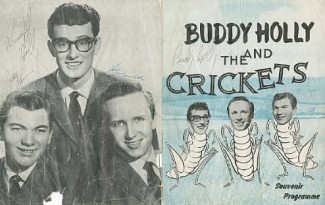 Autographs of Buddy Holly and The Crickets, in blue biro on a piece of paper additionally inscribed The Crickets, mounted with colour picture, 26.5 x 18cm (10½ x 7in) overall Sold for £478 at Bonhams – Rock and Roll and Film Memorabilia, 16 Nov 2004, Knightsbridge, London. Holly turned to rock music after seeing Elvis Presley sing live in Lubbock in early 1955. A few months later on October 15, he opened on the same bill with Presley, also in Lubbock, catching the eye of a Nashville talent scout. Holly’s transition to rock continued when he opened for Bill Haley & His Comets at a local rock show organized by Eddie Crandall, who was also the manager for Marty Robbins. As a result of this performance, Holly was offered a contract with D ecca Records to work alone, which he accepted. According to the Amburn book, his public name changed from “Holley” to “Holly” on 8 February 1956, when the Decca contract he signed misspelled his last name. That spelling was then adopted for his professional career. Among the tracks recorded for Decca was an early version of “That’ll Be The Day”, which took its title from a phrase that John Wayne’s character said repeatedly in the 1956 film, The Searchers. Decca wouldn’t publish his recordings, though, and dropped his contract. But they also insisted he could not record the same songs for anyone else for five years. Back in Lubbock, Holly formed his own band, although at that time it had no name and would only later be called The Crickets and began recording at Norman Petty’s studios in Clovis, New Mexico. Norman had music industry contacts and believing that “That’ll Be the Day” would be a hit single, he contacted publishers and labels. Brunswick Records, a subsidiary of Decca, signed The Crickets. Soon after, they signed Holly as a solo artist on another Decca subsidiary Coral Records. This put Holly in the unusual position of having two record contracts at the same time. Before “That’ll Be The Day” had its nationwide release, Holly played lead guitar on the single “Starlight”, recorded in April 1957, featuring Jack Huddle. The initial, unsuccessful version of “That’ll Be The Day” played more slowly and about half an octave higher than the hit version. Holly managed to bridge some of the racial divide that marked rock n’ roll music. While Elvis made black music more acceptable to whites, Holly won over an all-black audience when the Crickets were booked at New York’s Apollo Theater (though, unlike the immediate response depicted in the 1978 movie The Buddy Holly Story, it actually took several performances for his talents to be appreciated). 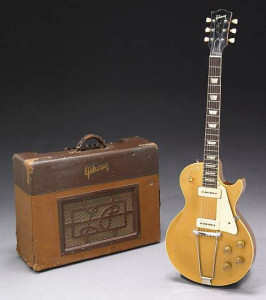 Buddy Holly’s electric guitar and amplifier, the 1953 Gibson Les Paul ‘gold-top’ model with maple top, mahogany back, neck and headstock, rosewood fingerboard with crown markers, Kluson machineheads with plastic tulip pegs, P90 pickups, trapeze wrapover tailpiece, in original Gibson case; and a Gibson Les Paul model ‘G’ amplifier, original Jensen speaker, Buddy Holley scratched into bacj from Bonham’s Rock n’ Roll & Film Memorabilia including James Bond, 16 Nov 2005, Knightsbridge. After the release of several highly successful songs in 1958, Holly and the Crickets toured Australia in January and later the United Kingdom. That same year, he met Maria Elena Santiago (born 1935 in San Juan, Puerto Rico) while she was working as a receptionist for Peer-Southern Music, a New York music publisher. According to a romanticised version of the truth encouraged by Maria Elena, he proposed to her on their very first date. She initially thought he was kidding, but they were married in Lubbock on 15 August 1958, less than two months after they met. “I’d never had a boyfriend in my life. I’d never been on a date before. But when I saw Buddy, it was like magic. We had something special: love at first sight,” Maria told the Lubbock Avalanche-Journal on the occasion of what would have been the Hollys’ fiftieth wedding anniversary. She resides in Dallas. Maria traveled on some of the tours, doing everything from the laundry to equipment set-up to ensuring the group got paid. 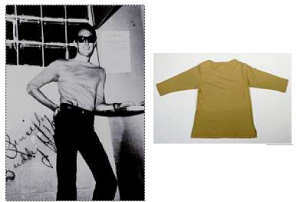 A Buddy Holly stage worn t-shirt, 1958 – Made of mustard-yellow cotton with a boat neck, three-quarter length sleeves, and two notches on either side of bottom hem, Holly wore this shirt on July 9, 1958 at Matter’s Ballroom in Decorah, Iowa during his ‘Summer Dance Party’ tour. Included is a reprinted black and white image showing Holly wearing the shirt and an affidavit signed by Maria Elena Holly, Buddy’s wife, confirming its authenticity sold for $2,400 at Bonhams Entertainment Memorabilia including Animation & Illustra tion Art, 9 Dec 2007, Los Angeles. The ambitious Holly became increasingly interested in the New York music/recording/publishing scene, while his younger and more easygoing bandmates wanted to go back home to Lubbock. As a result, in 1959 the group split. Holly began a solo tour with other notable performers, including Dion and the Belmonts, Ritchie Valens, and J. P. “The Big Bopper” Richardson. After a performance in Green Bay, Wisconsin at the Riverside Ballroom, on 1 February the tour moved on to the Surf Ballroom in Clear Lake, Iowa on 2 February 1959. Afterwards, Buddy Holly chartered a Beechcraft Bonanza to take him and his new back-up band (Tommy Allsup and Waylon Jennings) to Fargo, North Dakota, enroute to play the next leg of the Winter Dance Party tour at the Armory in Moorhead, Minnesota. Carl Bunch missed the flight as he had been hospitalized with frostbite three days earlier. The Big Bopper asked Jennings for his spot on the four-seat plane, as he was recovering from the flu. Ritchie Valens was still signing autographs at the concert site when Allsup walked in and told him it was time to go. Valens begged for a seat on the plane. Allsup pulled a 50 cent coin out of his pocket and the two men flipped for the seat. Allsup lost. 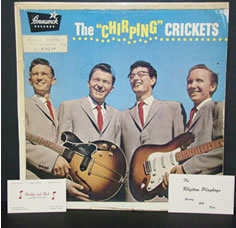 A rare 1957 Buddy Holly & the Crickets record album, titled Chirpin’ Crickets and signed by all four members of the group (including Holly). The album (Brunswick Records, BL54038) includes the hits That’ll Be the Day, Oh Boy, Not Fade Away and Maybe Baby. An error on the jacket (“Bullock,” Texas should read Lubbock, Texas) only adds to the album’s desirability. The plane took off in light snow and gusty winds at around 12:55 A.M., but crashed a few minutes later. The wreckage was discovered several hours later by the plane’s owner, Jerry Dwyer, some 8 miles (13 km) from the airport on the property of Albert Juhl. The crash killed Holly, Valens, Richardson, and the 21-year-old pilot, Roger Peterson. Holly’s body, along with those of Valens and Richardson, was thrown from the wreckage. Holly and Valens lay 17 feet (5.2 m) south of the wreckage and Richardson was thrown around 40 feet (12 m) to the north of the wreckage. The pilot’s body remained in the wreckage. All had suffered severe and multiple injuries. Without any doubt, all had died on impact, with the plane hitting the ground at 170 mph (270 km/h). While theories abound as to the exact cause of the crash, an official determination of pilot error was rendered by the Civil Aeronautics Board. Although the crash received a good deal of local coverage, it was displaced in the national news by an accident that occurred the same day in New York City, when American Airlines Flight 320 crashed during an instrument landing approach at LaGuardia Airport, killing 65. Don McLean referred to it as “The Day the Music Died”. Holly’s pregnant wife became a widow after barely six months of marriage and miscarried soon after. Holly’s funeral was held on 7 February 1959 at the Tabernacle Baptist Church in Lubbock under the direction of Sanders Funeral Home. His body was interred in the City of Lubbock Cemetery in the eastern part of the city. Holly’s headstone carries the correct spelling of his surname (Holley) and a carving of his Fender Stratocaster guitar. 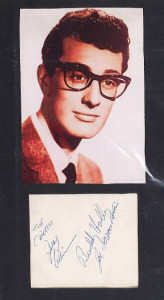 Major auction houses such as Christies and Bonhams hold regular Film Memorabilia and Rock Memorabilia sales which regularly feature Buddy Holly items. With the advent of the Internet access to items is easier than ever, but always remember ‘Caveat emptor’. 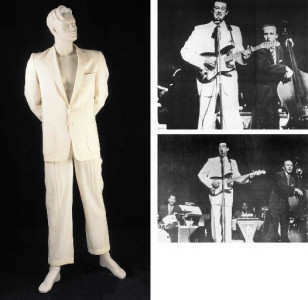 A simple ‘Buddy Holly‘ search on ebay will normally return many thousands of items ranging from original clothing to figurines and from music boxes to records. Historical text – Copyright (C) 2000,2001,2002 Free Soft ware Foundation, Inc. 51 Franklin St, Fifth Floor, Boston, MA 02110-1301 USA Everyone is permitted to copy and distribute verbatim copies of this license document, but changing it is not allowed.